The Earth has barely been explored in terms of its vast energy potential. New sources of energy are cropping up in unlikely places, on an almost daily basis. South Africa, for example, is now moving ahead to develop its significant native shale resource. 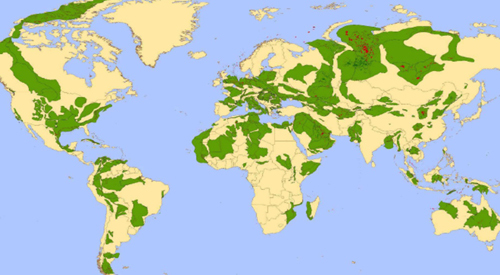 Notice that the map of shale resources above is incomplete, with large areas "greyed out". 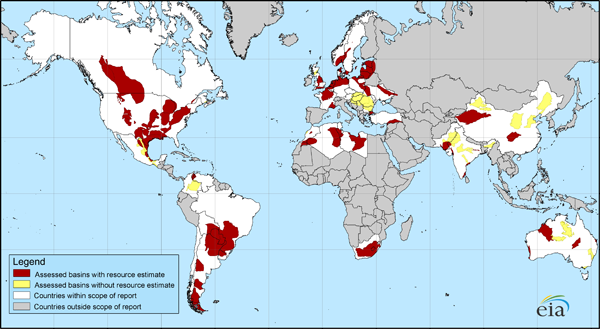 The map below reveals a broader view of the presently known global shale resource, but even that map is woefully incomplete. JOHN Howard has warned that the development of the shale gas industry in the US could shake up the global energy scene and have a dramatic impact on China and Australia. Australia is yet another energy-rich country that has just begun to discover its potentially huge shale resource. We should not forget China, which is thought to possess a gargantuan resource of shale gas. While China is unlikely to ramp up shale production rapidly, it is already using the threat of its shale gas to negotiate much tougher terms with Russian gas company Gazprom. On Tuesday, Chinese sources told Platts in Astana that price remains the key issue in the negotiations, echoing earlier statements by the Russian side. Left unsaid in most press reports is the profound impact of North American shale oil & gas development on the energy hopes and dreams of other nations possessing large reserves of shale hydrocarbons.